This is my favorite time of the year for cooking soups. I love the fact it can be made ahead of time , if entertaining and the left overs can go in the freezer. It’s great to have something on hand when it’s cold outside. This recipe is courtesy of Ina Garten. She revised it so that it is quicker in cooking time. Heat the oil in a large dutch oven add the bacon and cook over medium heat for 8 to 10 minutes. Stir occasionally til lightly brown. 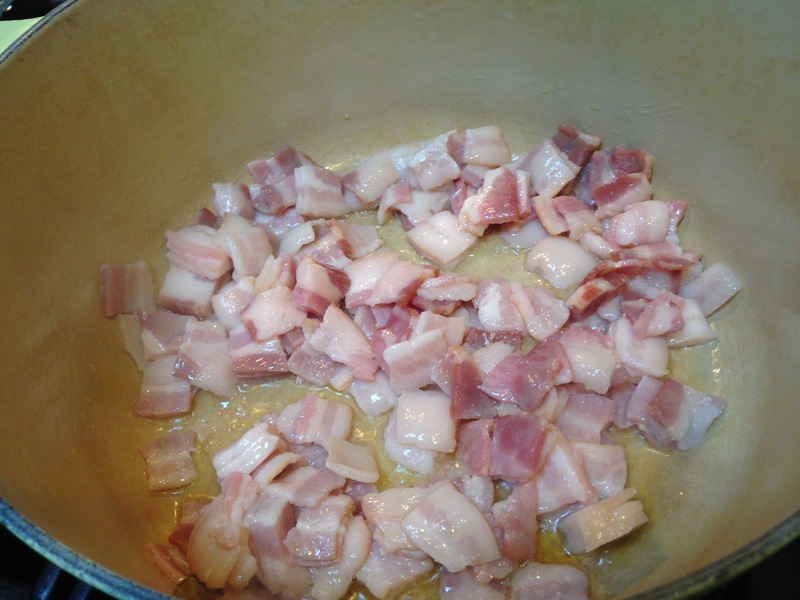 Using a slotted spoon remove the bacon onto a plate. Dry the meat and sprinkle with salt and pepper. In batches of single layer brown on all sides. Remove to the plate with the bacon. 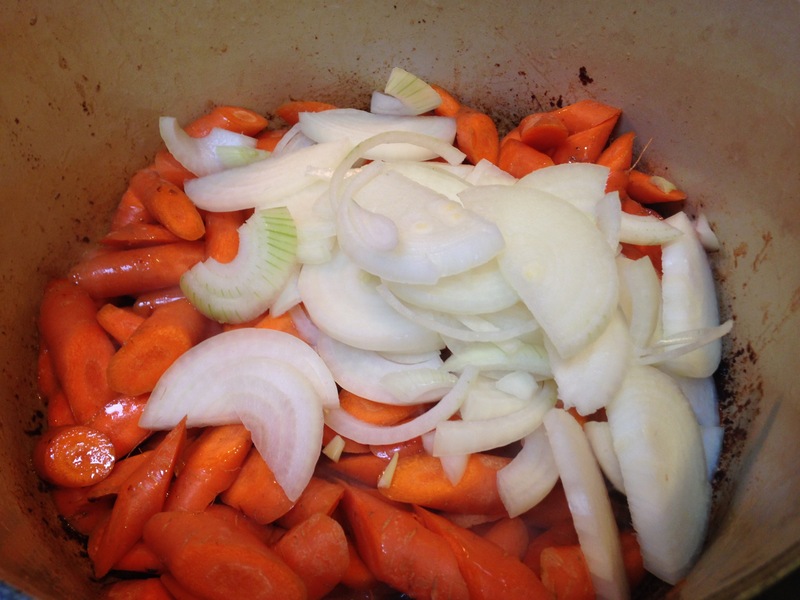 Toss the carrots, onions, 1 tablespoon salt and 2 teaspoon of pepper in the fat in the pan and cook over medium heat for about 10 to 12 minutes, stirring occasionally till the onions are slightly brown. Add the garlic and cook for 1 minute more. Add the cognac, stand back, ignite with a match to burn off the alcohol. ( skipped this part) . Put the meat and bacon back in the pot with it’s juices. Add the wine and enough beef broth to just cover the meat. Add the tomato paste and thyme. Bring to a boil, cover the pot tightly and place in the oven for 1 1/4 hours or till meat and vegetables are tender. Remove from the oven and place on to stove top. Combine the flour and 2 tablespoons of butter with a fork and stir in the stew. Add the frozen onions. 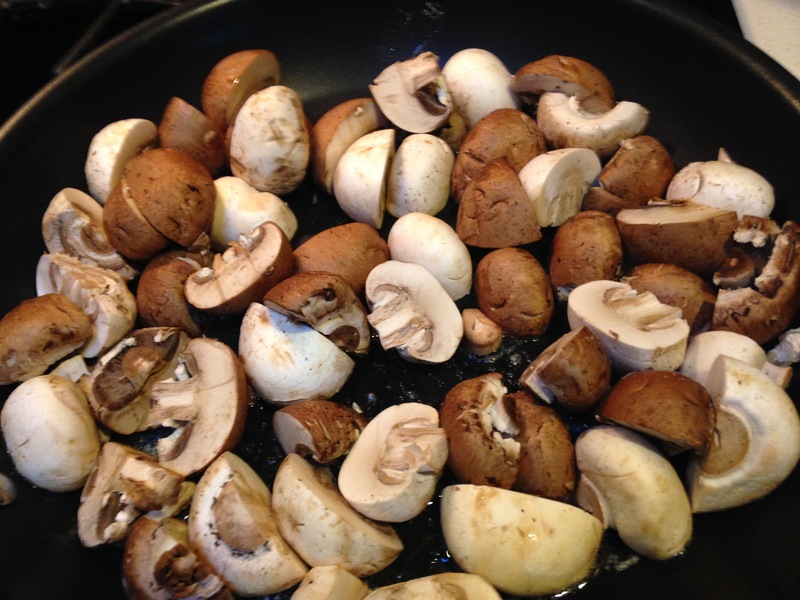 In a medium pan, saute the mushrooms in the remaining butter over medium heat. Cook for 10 minutes or till lightly brown and then add to stew. 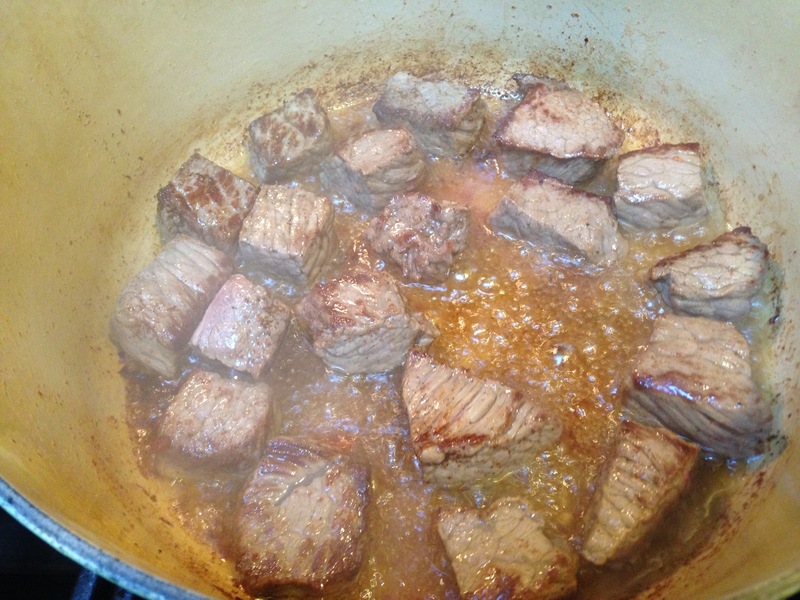 Bring the stew to a boil, lower heat and simmer for another 15 minutes. Season to taste. Serves 6.